The birds here in our neighborhood are absolutely ravenous for birdseed. They can clear out our moderately-sized feeder in a single day. It's mostly finches, chickadees, and sparrows—and of course, those ugly, ubiquitous grackles. The squirrels would normally be a problem, too, but the birds eat up the food so quickly that the bushy-tailed, tree-dwelling rodents often don't even get a crack at raiding the feeder before it's empty. 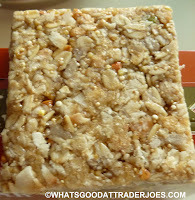 In light of all that, it's pretty obvious that our backyard buddies would love a shot at one of these birdseed bars. It would be gone in minutes, maybe seconds. I'm not sure how good tapioca syrup, cane sugar, and maple syrup are for birds, but I am sure they'd happily deal with the consequences for just a taste of all those yummy seeds and grains. Channeling her inner-bird, Sonia, too, makes short work of these Raises the Bar bars. 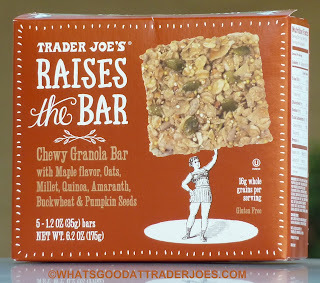 I liked them okay, but I think I've had too many other granola bar type selections from Trader Joe's that I liked the taste of better. The Fruit and Nut Trek Mix Bars come to mind—and the much more recently-reviewed Organic Chia Bars do as well. Appearance-wise, Raises the Bar are very similar to the chia bars but are square, rather than rectangular. There are bunches of seeds and tiny ingredients all smooshed together, united by the aforementioned syrups and honey. The base is most definitely oats, and accordingly, they taste quite "oaty." They're also very mapley, with a significant sunflower component as well. 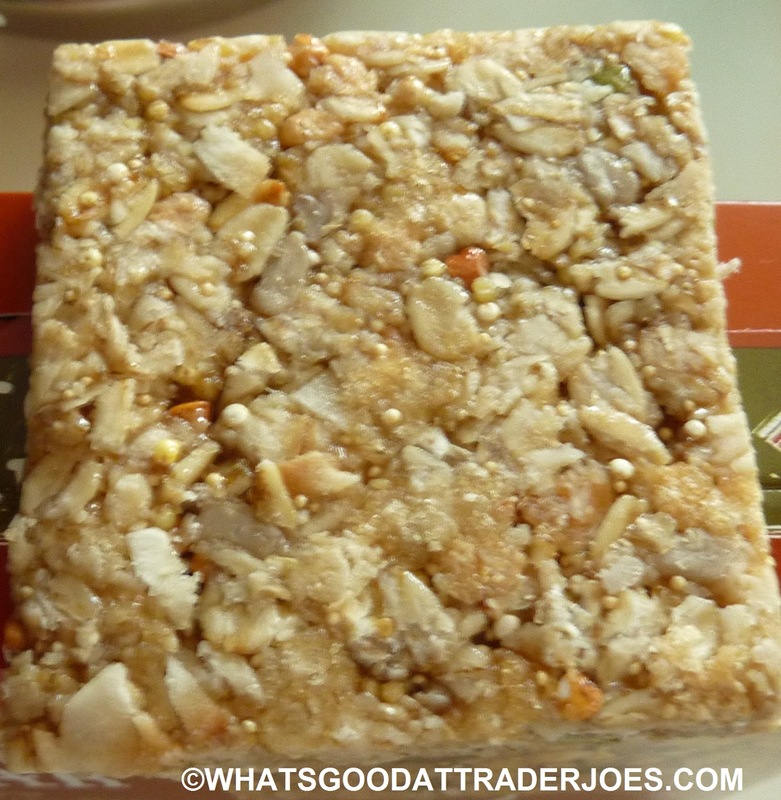 They're chock full of whole grains and are conveniently individually-wrapped. Five bars for $2.79 makes this a pretty decent value, too. If you're looking for a super simple breakfast option or even just an easy afternoon snack, these bars are worth a purchase. In the end, it all comes down to taste, and Sonia just appreciated these a bit more than I did. Four and a half stars from her. Three and a half from me. 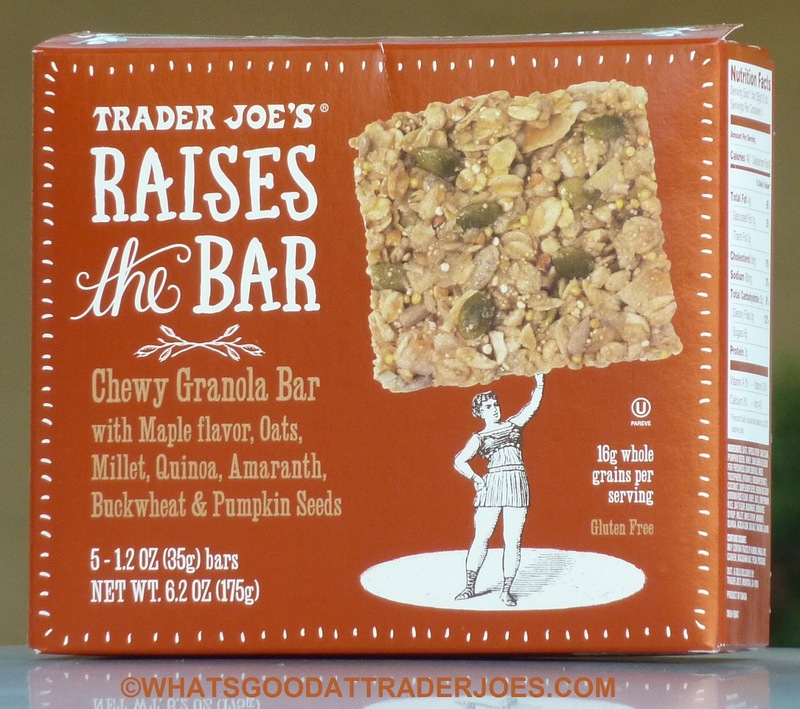 These are kind of brilliant compared to so many granola bars that are overly sweet and contain weird fake ingredients. I liked mine best ripped apart and in yogurt for a quick breakfast, but i might like the chia bars a little more too. These would be tasty with yogurt. Good idea. Don't put it in the garbage! Take it back and get something you do like, TJs has the best return policy around. Love your blog. I tried something new at TJ's last week and thought of you. It was humus flavored with curry. One bite and it went in the garbage! I wondered if you had reviewed it - (I'll search). They are good, but pretty much just like a bar that Kind makes. I love TJ's but sometimes tire of the copycat stuff.